Every week or so -- no, really, almost every week or so -- I meet someone new who tells me I look familiar. And every time, I have to politely (usually) tell them that we don't actually know each other. Sometimes we play the let's-stalk-mutual-friends-on-Facebook to see how we know each other. Sometimes we play the which-school-did-you-go-to game that ends with us not actually having any common connections. And sometimes I just nod and proceed with life. I can't quite place my finger on when this trend started. I secretly used to think it must be because I am famous from this blog, but let's be real, it's definitely not that. But it's been happening more often now. What's an education if you become famous? By Cazey Williams So, not to name names, but my alma mater – an institution of higher learning, or so I thought – has recently taken up promoting a “recent student” of theirs for a reality show contest. What does “recent student” mean? You would think alumni, right? No, earnest readers; it means a freshman who failed out. Are you even a freshman if you fail out? And it’s not like he failed this past May, so he could do a redo/have a second life/this isn't Mario Kart. No, no, he failed out two years ago (2013). 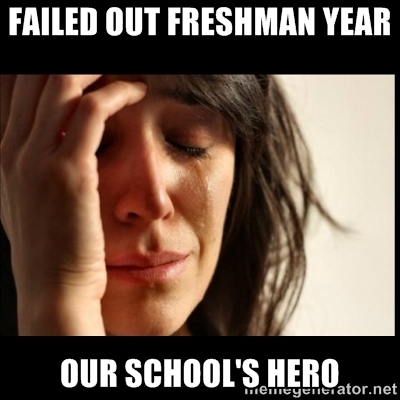 But you know, we should give him a break; freshman year was hard, especially those keg stands. To elaborate: There is a male of conventional standards - aka Caucasian, brown hair, attractive, dumb (is that a stretch of an assumption? But had to throw this in, or else I'd be describing myself *recoils*) – who attended my undergrad and is now on a competitive reality show (hint: singing, Gwen Stefani, etc.). I haven’t done much research because TV isn’t my thing, nor is fanboying, but I know he’s been on the show a couple of weeks. However, this child happens to have attended my old university for a year before he failed out. Or maybe he withdrew, but from what I know, his grades weren’t getting him car insurance deals. How do I know? Well, I have my sources. And the facts are, he went to my university and never came back, and there’s a gap year between then and now. ~Suspicious~ Ain’t like he was in New York pursuing ~the dream~. If he wants to say he went to my alma mater, fine. But what pricks me the wrong way is my INSTITUTION OF HIGHER LEARNING (did you get that last part?) wants to uphold him as some student and representative of our university by Facebooking and Tweeting "Tune in tonight to watch our pillar of success fail-out perform" or "We're cheering for our recent student (who everyone should try to emulate), and here's how to vote." YO, DEANS AND PRESIDENT, he failed out (?!?!). What sort of message are you sending?